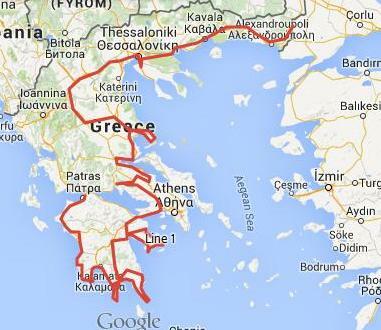 Our aim for the end of this week was to be in Alexandroupoli which meant a fairly hefty 500 miles of driving coming. We decided against a sight-seeing route and went for the motorway, it must have been our two days for being lucky – instead of being charged Class 4 due to our height each of the four manual toll booths gave us the Class 1 car rate – result as our total tolls for the completed journey were €8.20. We don’t know why, we just smiled and handed over our cash. As we headed North from Kastraki the countryside changed so much that it began to resemble North Wales more than what we have become used to as being Greece. Plenty of rolling hills with conifers and farmland in place of olives and citrus groves, the only exception was the almond tree orchards. A very quiet and pleasant drive with the exception of a motorway closure near Kavala, no diversions, no signs just a big blockade across the road. We went straight to Plan B, follow the traffic into town and hope they are all looking for the diversion. 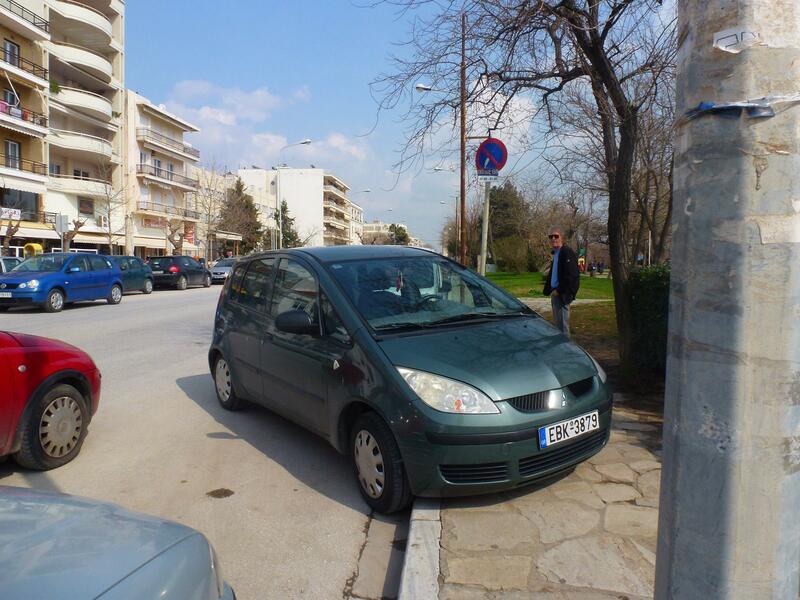 All seemed good until we arrived on Kavala docks and vehicles started parking up on the quay! Luckily we spotted a lorry heading up a hill from the docks and decided to follow him, good plan as he took us back to the next open junction on the motorway – more luck than judgement as usual. 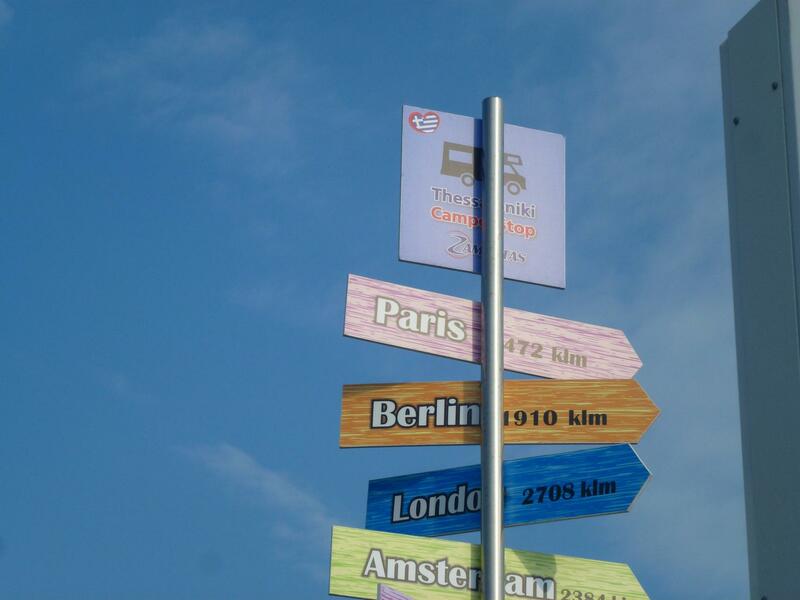 For me the best bit about the motorway trip (of course except the cheap as chips tolls) was the road signs, not sure why but seeing a sign for Bulgaria and Turkey was a bit of a special moment for us, made us realise how far we have travelled. And let’s be honest, a sign with a mummy and baby bear would be just amazing no matter where in the world it was. I never knew we had wild bears in Europe, a bit stunned to find they reckon upwards of 150 pairs are roaming free. For about 40 miles there were massive fences along the motorway, not sure if that is to keep the said bears off the motorway but couldn’t see any other reason. We broke the journey with a stopover at Zampetas Camperstop at Thessaloniki, its a caravan and motorhome repair shop that has a free camperstop area. It was over 35 km off the motorway, albeit down another motorway, and smack bang at the end of the of the airport runway. They had a quick look at our ‘dint’ that was once a back bumper panel and said they couldn’t do anything in just 24 hours so we will continue with the gaffer tape look. We asked if ok to stay, they could not have been more welcoming, parked us up and settled us in for the night. We are now as far East as we can go in Greece, it’s very out on a limb with not much of the rest of Greece close by. Turkey is 40 km away and this may be why the town has a massive army and police presence, very much a Garrison town. Looking at the history of the town its been owned or occupied by pretty much everyone in the region at some time, the Russians, Turks, Bulgarians and Germans have all staked claims at different times. There is a very calm and unhurried feeling here, the pavement cafes are heaving, standing room only in most of them, especially the ones that seem to be for those who want to look and be looked at. Going our for coffee in Greece seems to be the corner-stone of Greek life and they certainly do it with style. If you cant park in the space you want then pop it half on the pavement! Surprisingly for us we have made two forays into town and we actually quite like it. Big wide streets, good shops and prices that seem lower than the rest of Greece, a very laid-back vibe that we maybe didn’t expect in one of the bigger towns in the country. The promenade is one that will be lovely when its finished, looks as if it has been a work in progress for some years. 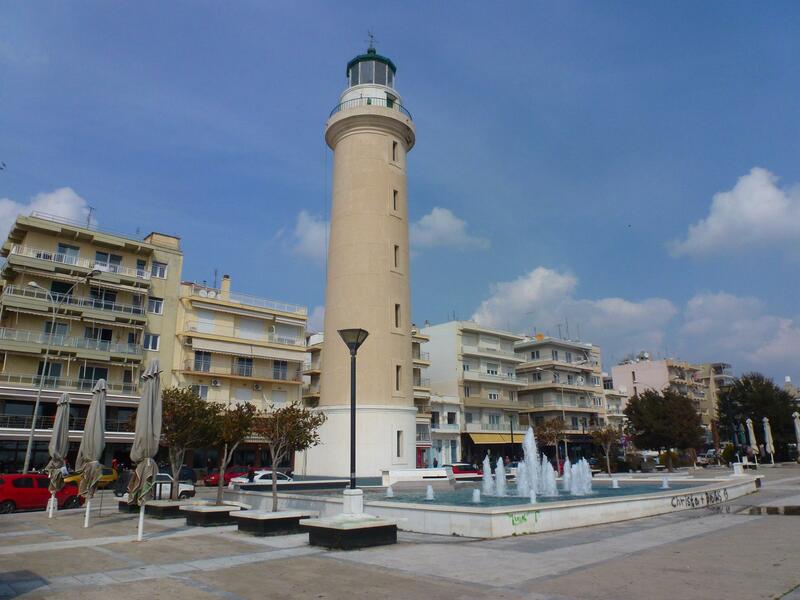 The landmark lighthouse is based squarely in the middle of the promenade but other than that there doesn’t appear to be too much in the way of tourist attractions other than the beach, suits us fine. In the park the main pastime was playing cards at an upturned cardboard box, at least ten card schools taking place and whilst we couldn’t see money changing hands it looked fairly intense if it was for match sticks. The time came Friday for the well overdue (5 months) haircut. We went into a rather snazzy hairdressers, I mimed ‘haircut’ and stylist nodded. Iain was only intending waiting for me but in the blink of an eye the male stylist had him in a chair where we was styled and blow dried despite his protestations, he is just about recovering from the whole episode :). If you look around in Greece the women do big hair, seriously big hair, think Mari Wilson and then double that thought. They were coming into the shop looking pretty normal and leaving with hair do’s that they struggled to get back out through the door, warning signals? When it was time for my cut the stylist roped in a customer who could speak a few words of English, between the three of us I thought we agreed on a trim. Not a hope in hell, my hair is now four inches shorter and was back-combed, with half a can of hairspray laminated in, to a height and width that would prevent me accessing many a low bridge restriction. Tomorrow we should cross the border into Bulgaria. We are fairly well prepared in that we have some campsite details and a reasonably vague idea of where we want to go, even emailed the first campsite we planned to use to check they are open. We received a response that no they are closed 😦 but they live 15 minutes from the campsite so come and camp on their driveway for a few days, or even use the spare room in their house :). Bulgaria is already sounding like the kind of country we are going to like. We have loved Greece more than we ever imagined but Bulgaria and Romania are beckoning and we are both very much looking forward to countries we have never visited before. The ‘should’ above comes about because we have a niggly little problem which may delay our departure – the van wont start! We tried to pop out this morning to visit the Turkish border and the Elvros Delta park, the van battery is dead as the proverbial Dodo. Left it on the in-van dual charger all day and still not a hope of starting. It’s not worth calling out the breakdown on a Sunday so we will give them a call tomorrow as see what they suggest (we know its likely to be a new battery!). So we may be in Bulgaria tomorrow but then again – who knows! 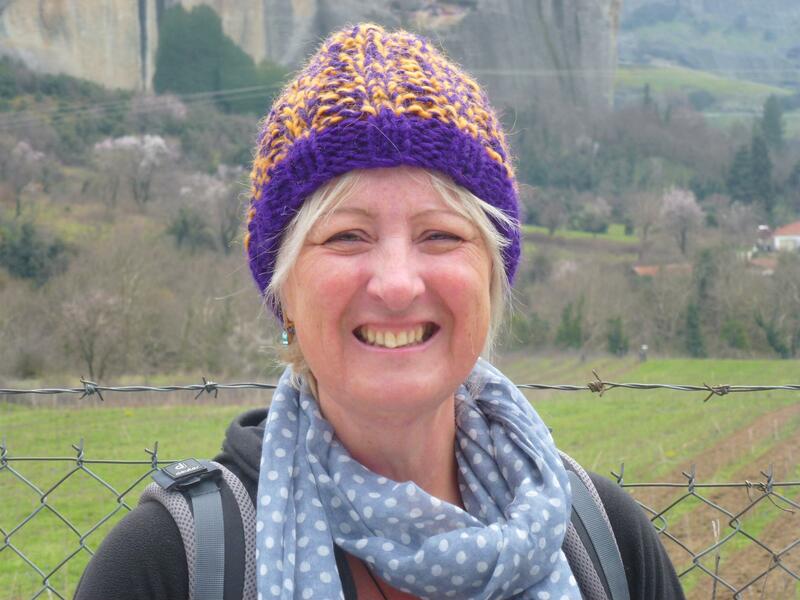 On the positive side thank the Lord we didn’t pop into Turkey as I wanted to – we don’t have breakdown cover there, phew! No matter how much we enjoyed the week at Kato Gatzea, it was lovely driving off and being back on the road. Even better we found the new Volos ring road this time, so what took 3 hours last time took 25 minutes this time – its all so easy when you know how 🙂 The ring road is so new its not on Sat Nav yet and possibly not on the radar of many locals as hardly a car on it, therefore I do not feel as bad that we didn’t find it on the way in. We couldn’t find a reason to visit the city of Volos but driving round the edge you get a fabulous view right across and down to the sea, miles of white buildings with hardly a high-rise in sight it looks more like a large town than the second city of a country. We were straight out to the motorway where we treated ourselves to a toll (€10) from Volos up Larisa. Tolls are odd here, we paid based on our height not our length, if we have been 6 cm lower then it would have cost us €4. Then again if we had come off at the exit half a mile before the toll booths it wouldn’t have cost us a penny – they don’t have that many toll booths so it would be easy to just come on and off and skirt around them if you so desired. From there is was straight up the dual carriageway to Kastraki, and the nearest campsite to Meteora. 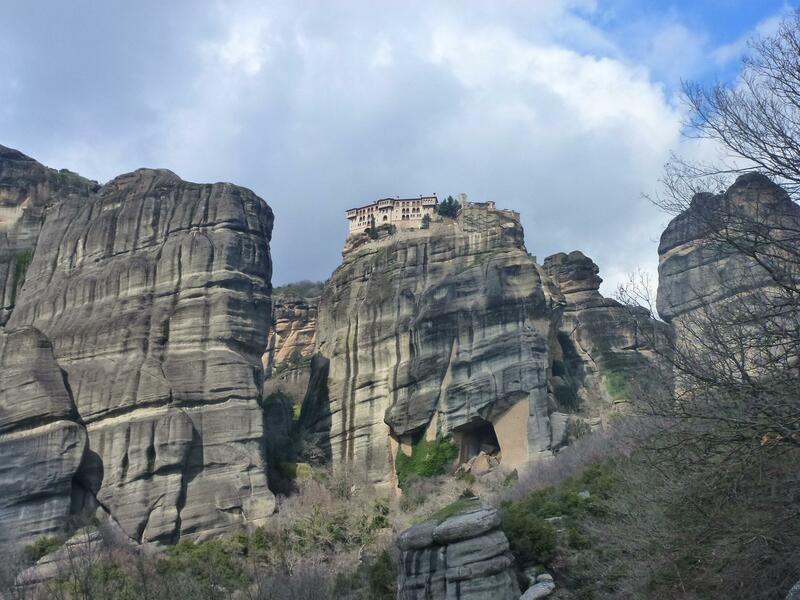 You can see it from 10 km away, amazing outcrops of sandstone rock towers that loom over Kalambaka and Kastraki. We pulled up at Camping Kastraki and as usual not a soul about, its right in the middle of the village of Kastraki beneath the sandstone pinnacles which look close enough to touch. 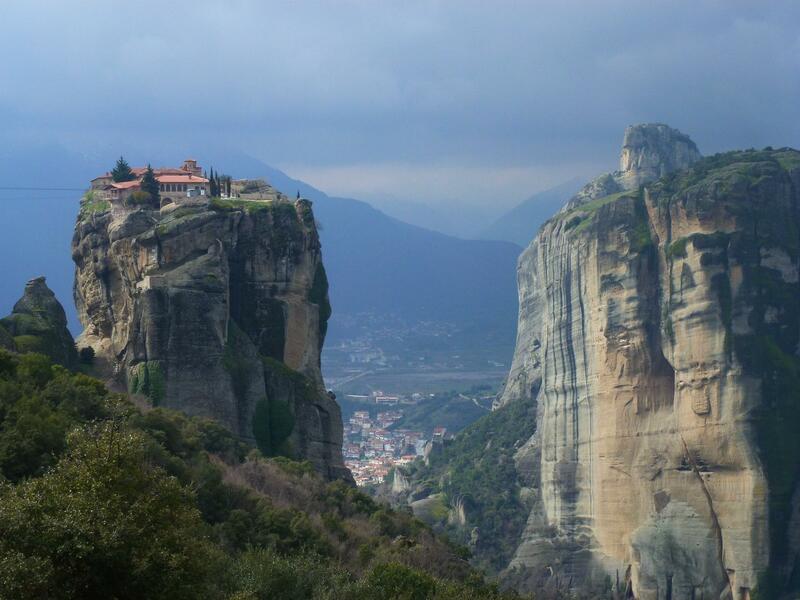 The name Meteora means “middle of the sky” and very aptly describes the monasteries here which are perched atop the most incredible sandstone pinnacles. From some angles it looks as if they are built on top of mountains, which would be impressive, but they are each on a pinnacle. The tradition of Greek Orthodoxy has continued uninterrupted here for over 600 years, the complex is second in importance only to Mount Athos. 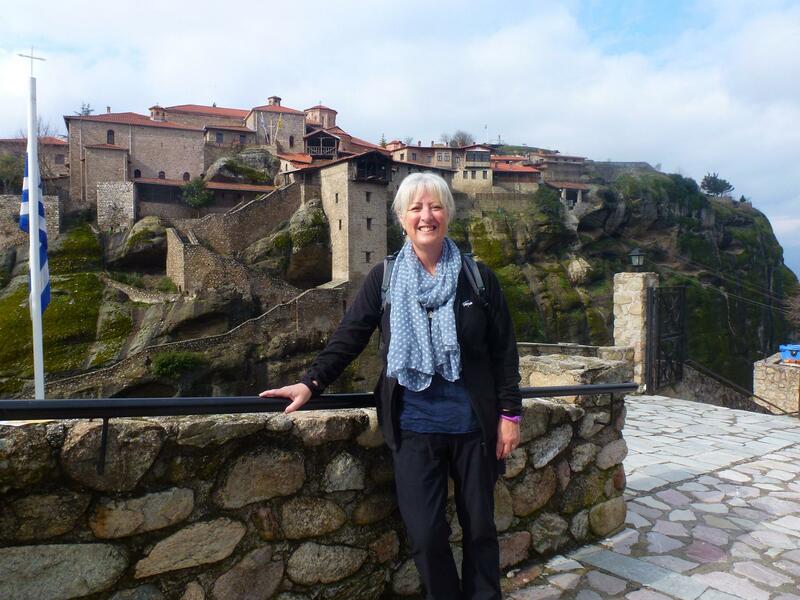 We can’t visit Mt Athos though as they do not allow women or children into their ‘state’ at all, even people working there must be over 18 and be men. I have no qualms on the equality piece, just a bit rubbish I can’t visit and see such an amazing place. Anyway, Meteora welcomes everyone, its actually a tourist centre nearly as much as a monastic centre to be honest. There were 24 monasteries but now only six monasteries are left, four are inhabited by monks and two by nuns. There are less than ten monks or nuns in each monastery, they have been all but turned over to tourism now and the whole area declared a UNESCO site. So they don’t really mind who comes and visits as long as you show a bit of respect, don’t wear shorts, women wear a skirt and you spend a few Euro. There is now a road that takes you around the mountain to each site, we took a taxi to the top and walked to each monastery and then back down. More than a bit of a hike, we only went inside one monastery and it still took us over 4 hours. The best way to describe the landscape is like something out of a science fiction film, a bit like the Hobbit with better castles. Slightly surreal where everything looks like a Hollywood film-set as surely no-one would really build massive buildings on top of 1200 ft sandstone rocks. The steps cut into the mountains that lead to each monastery are fairly new additions, most of which were completed in the 20th century, Before that everything and everyone was either hoisted up or down on ropes, climbed ladders lashed together or hoisted up 1200 vertical feet in a net (pilgrims included). The story goes that the priests used to decide it was time to get new ropes when the old ones broke! Not sure there isn’t some poetic licence there but new ropes or old there is no way on earth you would have gone up or down the sides of those cliffs held in a net unless you were one very brave monk. To get to all but one of the monasteries you need to climb the steps, first down the side of the mountain to a bridge and then back up the pinnacle the side, its hard going at this time of year so in summer it must be unbearable. 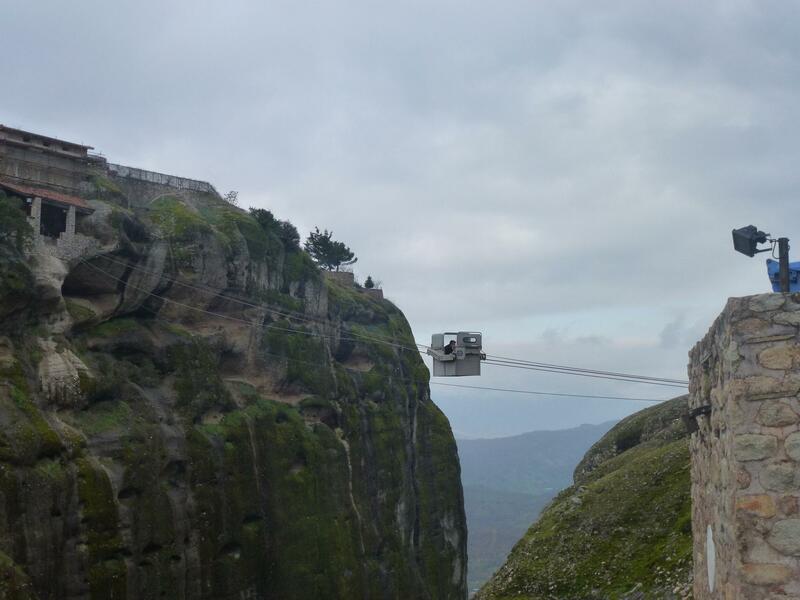 The monks have their own transport system, they installed cable cars at three monasteries – if you can call it that! We saw them in operation at two different places, to be honest you would not get me on one of them for all the tea in china. The highest and largest is Megalo Meteoro Monastery, supposedly the best monastery with the most to see inside, so we started there – just our luck then they close on a Tuesday. The next largest is on the next pinnacle, Varlaam Monastery, which was built in 1541 and thankfully open. We arrived at the same time as four tour buses, but managed to keep out of their way fairly well. 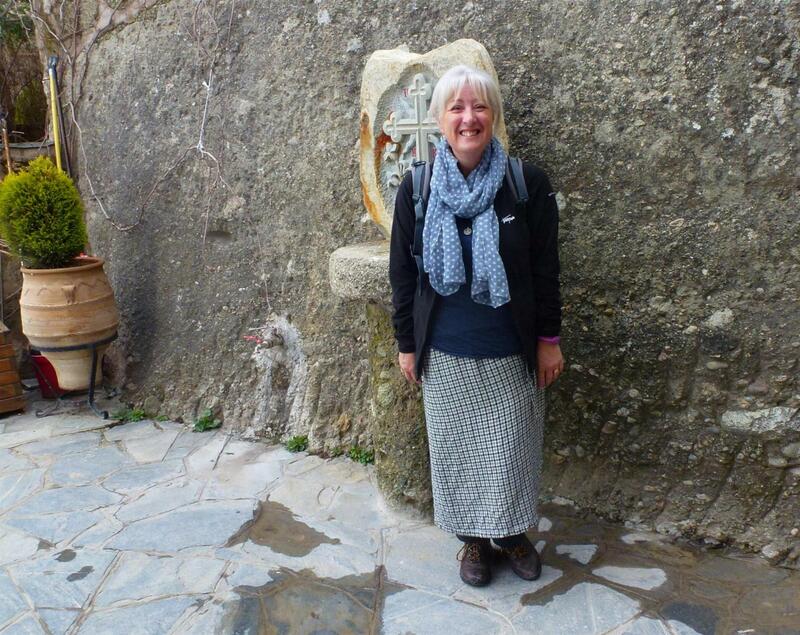 I was allowed inside the monasteries here, but the strict dress code means women must wear a skirt – not something I bought with me. The monks thoughtfully provide skirts for those of us that need one, mostly very fetching checked little numbers which were fine. All around the area are hundred of caves, before the monasteries were built the monks lived in them. Many look as if people still make use of them today, would guess its just locals and climbs. One cave has literally hundreds of flags hanging all around it. The taxi driver told us one man regularly climbs up to the cave and each time hangs a new flag. Amongst the caves are ruins of old churches, some perched on the edge of the caves, other just outside. Again, how they were built defies understanding. We walked across the couple of kilometres to probably the monastery that most people would recognise, that of The Holy Trinity as it was featured in the 1981 James Bond film ‘ For Your Eyes Only’. We sat down by the ‘cable car’ to have our picnic and as we did so the thing started moving. We saw the priest let someone in on the other side and send him over the gorge with a flick of a switch. It was mesmerising and terrifying all at once. The fella who came over didn’t even shut the door! There are a few tacky tourist tatt stalls outside the monasteries but not too many. There isn’t a cafe, restaurant or even a drinks wagon at any of them, which we did think was missing out on some major euro profit. They do provide loos, just not of the porcelain variety, obviously the one thing they never bothered hauling up the side of the rocks then! 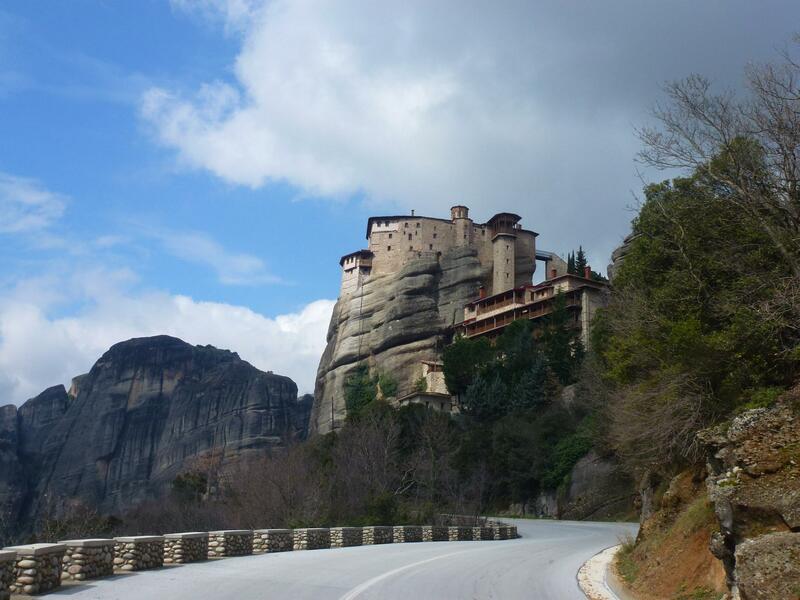 It is difficult to write about Meteora without listing out superlatives, for us it has been magical and we think one of the most memorable places we have yet to visit. The pinnacles themselves really would be worth seeing, add the caves and then the monasteries and its going to have to be a big contender for one of our Seven Wonders of the Baxterbus Tour. That’s us done with monasteries now, heading off today for Thessaloniki.